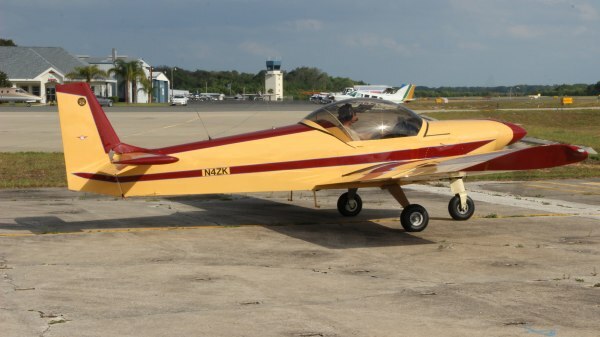 A few days ago, I spoke with Gary Burdett of Lincoln Illinois and covered some notes on his upcoming first flight of his Zenith 750. The conversation was fairly short because Gary had done all his homework, he knew what he was planning on doing and all his bases were covered. Near the end of today, (Sunday) Gary called to say he had done a 30 minute first flight, and all went well, absolutely no surprises. Again the conversation was fairly short. He is planning on going up again as soon as his local weather improves. We didn’t have to speak about any corrections nor issues, he didn’t have any to speak of. 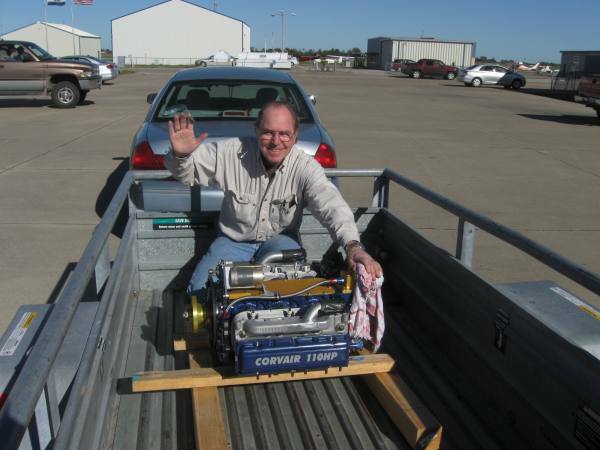 Above, Gary Burdett with the 2,850cc Dan bearing engine we built for his 750. It is rated at 110HP. He picked it up at the 2012 Zenith open house. His firewall forward is made of our standard off the shelf components for Zenith installations. Gary decided that he was going to take full advantage of our 9 years of successful Corvair installations on Zeniths by sticking directly to our the step by step notes in our Zenith installation manual. This is the best way to insure an uneventful first flight just like Gary’s. On his first flight, Gary stayed aloft for 30 minutes. He said the OAT was a cool 60F, but the CHT on the engine never exceeded 300F. Not bad for a brand new motor, on a design with a factory 575F limit. In hot summer weather with a fully broken in engine Gary’s instalation should run 350F in climb and 325F in cruise, a very large cooling reserve on the 750. One of the reasons why Zenith aircraft are so popular is the amount of engine choices available to builders. Compare two well-known LSA aircraft the Van’s RV-12 and the Zenith 601/650 series. The only engine allowed on the RV-12 is the Rotax 912. The Zenith can use a 912 also, but there are also seven other popular engines commonly installed. Zenith believes that if you are smart enough to build and fly a plane, you can probably select an engine that matches your needs. Sebastien Heintz, Zenith’s president, has demonstrated his commitment to this path by inviting many engine companies to his open houses and having a day at Oshkosh were there companies simultaneously met builders in the Zenith booth. To me, this fits with my perspective that homebuilding is about making educated decisions for yourself. The concept that a Homebuilder would be restricted to a single engine suggests both an inflexible airframe design and philosophy of post-sale control, neither of which are particularly appealing. Even the owners of certificated aircraft can select different engines through STC’s, homebuilts should have at least as much freedom. At Sun N Fun this year, I had at least 100 people a day walk into our Flycorvair booth and ask the same two questions: What does it weigh? and How much does it cost? Any builder who has these as the primary two questions is not ready to choose an engine, period. Notice above, I said I am in favor of builders making educated choices. I told every one of the people with the two standard questions that they needed to do more homework, specifically evaluating what they wanted out of an engine, and which characteristics were important. To open their mind a bit, I pointed out that even if an engine weighed only 100 pounds and cost just $1000, it would do you no good if it wasn’t reliable. The first thing you need to know about any aircraft power plant is simply it’s reliability. Many people think that this can be evaluated by simply asking the sales rep. What is the TBO? First, in the experimental world, companies often make up any number they like for TBO, particularly auto conversion companies. I have seen companies claim a 3,000 hour TBO on engines that had yet to have a single example fly more than 100 hours. If the engine made 100hp at 5000 rpm in a compact car, then the car would have done about 120mph at the power output that is used to fly a draggy plane. A 3,000 hr TBO says that you could take the same compact car and drive it at 120 mph for 360,000 miles without wearing it out or expecting it to break. Does that sound realistic? Think you could get a car to do 25 coast to coast trips at 120 mph /5,000 rpm? That is a pretty big goal, and it is only 500 hours. Real reliability is a much more complex issue than a TBO number. First, reliability is about how long between a power plant breaking, not how long it is before it wears out. In WWII, a Rolls Royce Merlin was considered a very reliable engine, but the TBO was only about 250 hours. It was not an issue of how long it lasted, the vital question was would it break without warning? An engine getting tired over time is acceptable, and engine breaking is not. My perspective on how to achieve reliability is to lower the stress on the engine by running it at a fraction of the automotive rpm and HP, increase the strength of internal components by using parts like forged pistons, make the fuel and ignition systems as simple as possible, and then train the operators to really care for the engine by allowing each of them to become his own mechanic/engine expert. I would love to take credit for this as an original idea, but two other engine companies thought of it first. You may have heard of them, they had some pretty good success with the concept. Their names are Lycoming and Continental. 1) Conversion, installation and flight ops manuals. 2) The availability of every single installation component, flight proven over nine years and 70 flying aircraft. 3) We have a separate on-line peer-to-peer discussion group just for Corvair/Zenith flyers to directly and freely share information and data with each other in a civilized productive format. 4) We have free Colleges and I still make free house calls. 5) the Corvair is fully insurable from hour number one, at the best rates. “If each Individual strives to be the best that they can be and follows their own course, then they are the primary beneficiary and all of society benefits as a secondary beneficiary. The Individual is free and society evolves in a positive direction. There are benefits not immediately obvious. Such as a huge increase in mentors and role models. I know now that I am only half as much as I could have been because there was not enough quality science exposure in my early education. “Hi William, I’ve been trying to think of something clever to say all week but can’t think of anything, but I feel the need to send a small message of encouragement. I look forward to every evening after a long day at work, (sometimes followed by an evening flight if I’m lucky) when I read your blog. All of the positive things people are saying are right on. Keep up what you are doing and please don’t change! You are both informative and entertaining. I have said this before but again thank you for all of the help you have given me since I started my engine build. “Great reality check, especially for us noobs at the bottom of the ‘hiking trail up the hill’. It’s notable that folks critical of even your very high level of ‘transformation’ (I like better than ‘conversion’) of the motor, don’t seem to do any research on O-200 part failures. 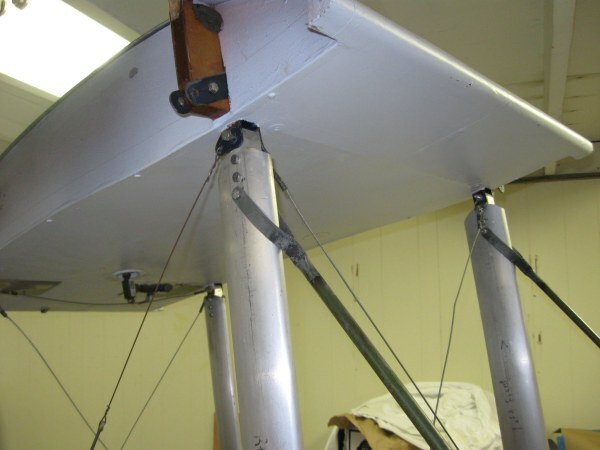 5th bearing, de-rating power, non-aerobatic rating, and propeller choice wisdom (and of course, airframe choice), are all parameters you have created that have highly reduced risk down to a non-issue in general. Therefore, specific follow up in craftsmanship and quality part choices falls to the builder. “Hi William, I feel confident you will keep writing your mind, so no worries here. People worry about attracting new people to aviation, so one approach is to sugarcoat the risks. I think it’s better to encourage people with a healthy approach to risk management. As a smart but initially uninformed person, knowledge of the actual risks and ways to mitigate them is my way of overcoming fear. That’s what you lay out in your manual and website, and I think the stories just fit in w/ risk management. My recent injury is an example of letting my guard down after 23 years of attention to safety detail. If the photos are small, try hitting the “F5” button at the very top of your keyboard. It has taken a little while to regroup after SnF and CC#25, but here is a pack of photos from CC#25 for everyone to enjoy. It was a very positive event. We had 55 builders pre-register, and many more stop in for part of the event. Arnold’s crew from EAA Chapter 534 did an outstanding job as our local hosts, and they did the lion’s share of the work on making the event logistics go smoothly. Hats off to every one of them. 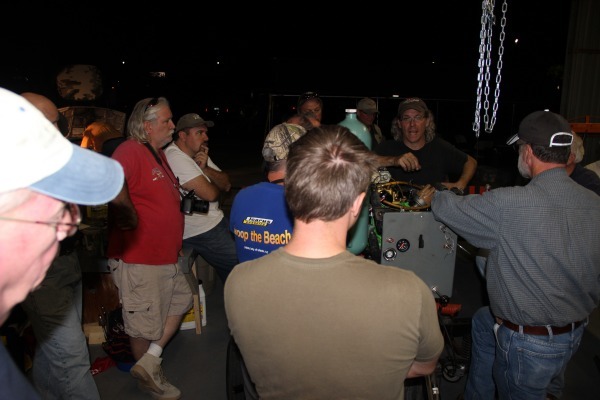 Above, the engine we are instructing on is Larry Magruder’s (in the maroon shirt at right) 2700 cc/Weseman bearing engine. It is going into his Zenith 650. Ron Lendon’s 601 XL, flown in from the Detroit area. His engine is a 2,850 cc/Roy bearing engine, also built at CC #17. Above, several of us get a detail session in on setting valves. Larry Magruder multi-tasks with Scoob E sitting duty while Grace takes photos. Spencer Gould, Embry Riddle trained, Pratt and Whitney engineer, sets his 2,700/Weseman bearing engine on the run stand. 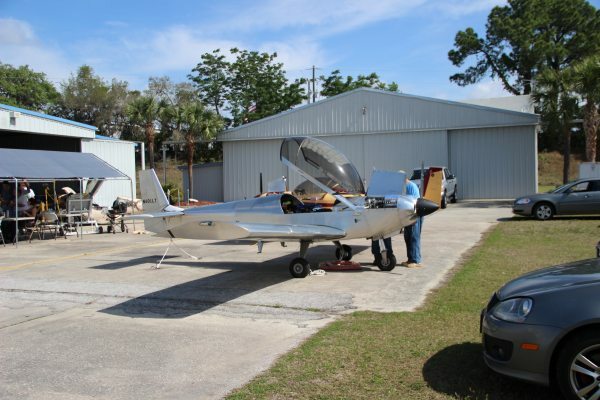 He is getting close to the finish line on his original design, composite, single-seat plane, the SP-500. 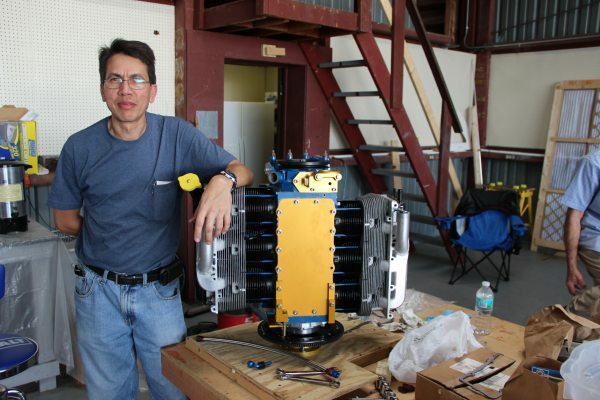 William Dominguez of Miami strikes a pose with his 2,700/Weseman bearing engine. He started with parts that he had prepped before the College, and did the complete assembly at the event in two days. The engine ran beautifully. It was the first engine he ever built. He had previously brought a core to CC #23, had a good look at how things are done, and then took action to make things work for him. The engine will power his 601 XL. 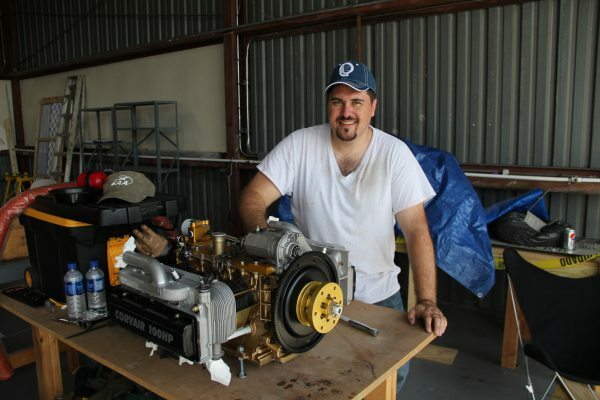 Spencer with his engine. It is the only Corvair I have seen that not only has gold parts, but is also painted gold. It ran great. 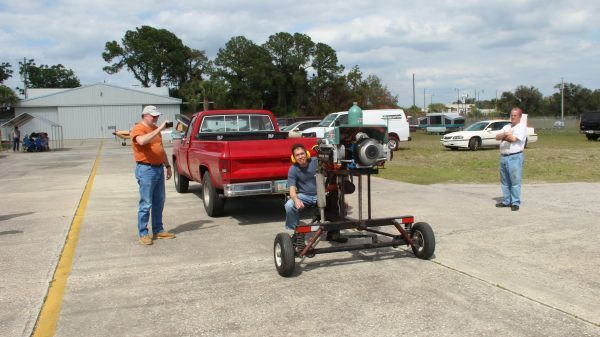 Joe Sarcione with his 3,000/Weseman bearing engine on the last day of the College. He also started with just raw parts. His prep work consisted of doing a lot of reading, including all the on-line installation directions that are in our parts catalog. The engine is destined for his Zenith 750. 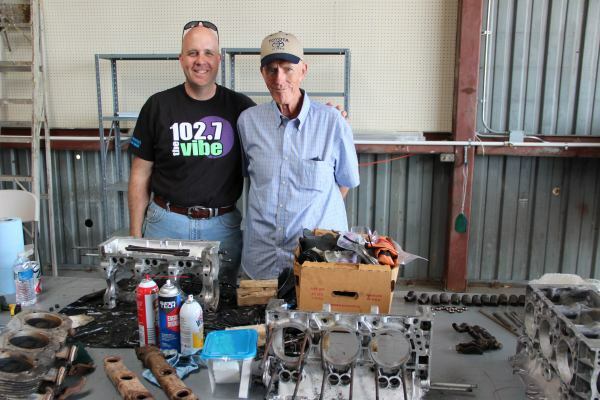 Father-son team of David and Bryan Walker from Arkansas stand behind their freshly torn down core engine. Roy Szarafinski and his lovely daughter Liese made a brief appearance at the College. They were on the return leg of an international trip and detoured over to spend much of Saturday at the College with builders. 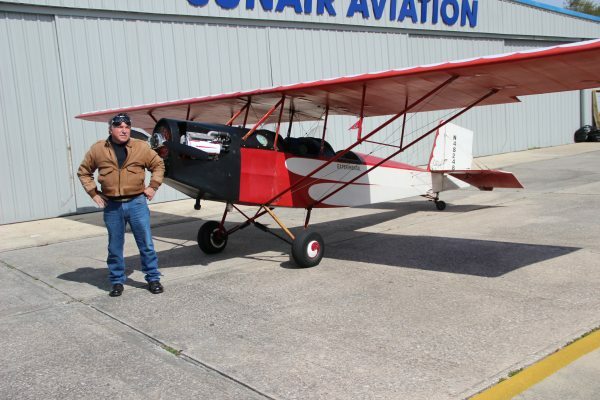 In between getting his display set at SnF and conducting the first flight of the Panther on Sunday, Dan Weseman also had a chance to assist builders at the College. 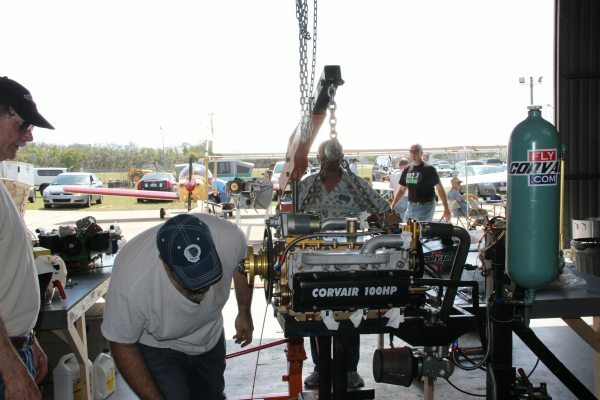 Many friendly hands made short work of getting William Dominguez’s engine ready for the first run. William Dominguez’s engine during break in. It went from ice cold, never started, to live and running in less than 3 seconds of cranking. The Redditt family works on their 3,000/Weseman bearing engine. It is destined for the family Zenith 750. Lynn Dingfelder’s 2,700/Weseman bearing 601 XL from Pennsylvania. Lynn had previously flown the plane to CC #20 in Michigan. After the College, Lynn took a short tour of southern Florida and then headed to SnF, where his aircraft was on display at the Zenith booth all week. 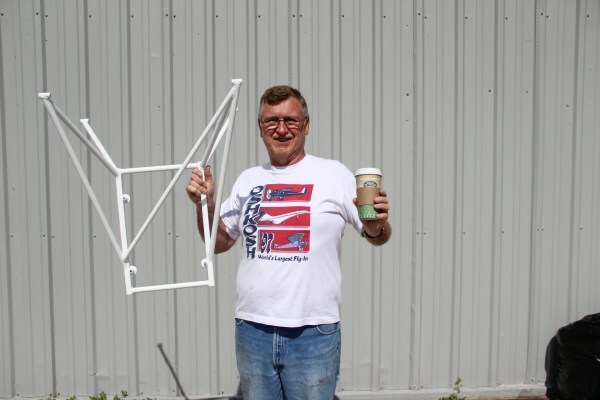 Lynn is very mechanically inclined, and he has very good judgement, but he is relatively new to flying. He got his sport pilot license four years ago and has slowly and carefully accumulated a few hundred hours, gradually expanding his personal flight envelope. 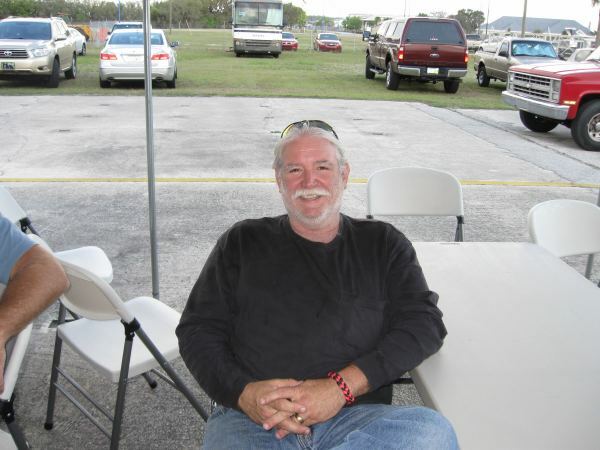 His experience and path is an excellent model for anyone new to homebuilding and flying. 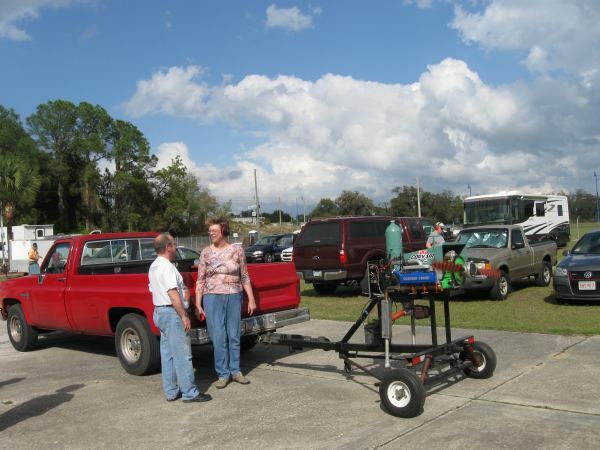 Larry Magruder and his lovely spouse Diane enjoy the prop blast from Larry’s engine on the run stand. The engine briefly ran at CC #24, but Larry decided he wanted to return to CC #25 and reset the valves and do some detail work under my supervision to make it run perfect. It worked according to plan, exactly. I have great respect for any builder who sets his standards high and sticks with them until his work is outstanding. Wittman Buttercup builder Daniel Kelley from California flew in commercial for the event and stayed for most of SnF also. He has attended many Colleges. 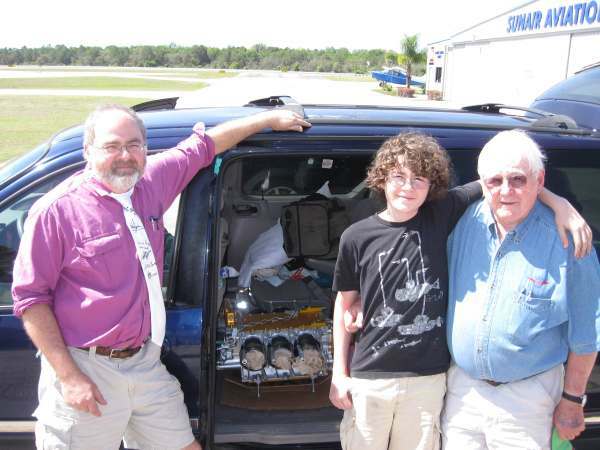 His plane will be powered by his 3,000/Roy bearing engine. EAA Chapter 534 had a Pietenpol project in the hangar that was the work of a very nice older gentleman who has a Ford Model A for it. 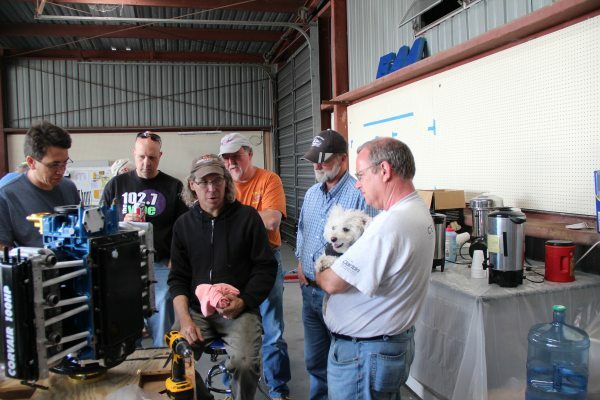 They are assisting the man with the completion of the aircraft. I took a photo of the project’s cabane strut arrangement. There is nothing wrong with using aluminum lift strut material; the loads on the vertical cabanes are not that high. However, no one, ever, should use this type of arrangement for the diagonal cabane going down to the top of the firewall. This would fold up like cooked spaghetti in the most minor of mishaps, and could even injure or trap the front seat occupant. The diagonal cabanes should be at least 7/8″-.049″ 4130 tubing, preferably welded to the front vertical cabane tubes. The Redditt family with their packed van at the end of the College. Charlie wears his ceremonial Corvair College tie for the photo. A close up of the Redditt’s 3,000/Weseman bearing engine. It started as a pile of parts before the event, all the way down to the case halves. They attended CC #24, made a plan, and followed through with it. Above, they are most of the way to an outstanding, first class engine. Carl Sagan, Corvair Owner, Practical Philosopher, Individual. I have always admired the work of Carl Sagan since I first saw “Cosmos.” He also wrote the story to the film “Contact“, which I think of as great Science Fiction. Many people in the Corvair world know that the one car he owned was a 1964 Corvair convertible, which has been restored since his passing. Above all else, Sagan was a first order observer of the human condition. I do not like conspiracy theories generated by the internet. I detest that stuff, it often shows how poorly educated people are to believe things that defy physics and simple observation. That stream of BS cries wolf all the time and often has the effect of numbing people to real issues that need to be considered, understood and addressed. My first year in College was going to night classes at Kean in NJ, about a million years ago. Most of the students were in their 30s and 40s and took the work seriously. I had a class on the Philosophy of Science in the 20th century. The professor started out by showing us how many of the scientists that had worked on the initial atomic weapons later morally regretted it, feeling that they had unwittingly played a role in making the end of life a real possibility. He then said this subject in 20th century was well worth studying, because it was just the opening round, a prelude of what was to come in the next 50 years. He brought up human cloning, artificial intelligence and the end of privacy and the restriction of choice. He pointed out that all of those things would be done by scientists or with tools provided by them, and we had damn well do a better job on the following rounds than we did on developing atomic weapons without considering where it almost lead. 32 years later, I am not so sure we have. The class largely was studying the work of four very influential writers. Jacob Bronowski http://en.wikipedia.org/wiki/Jacob_Bronowski, (who wrote the Ascent of Man), C.P. Snow http://en.wikipedia.org/wiki/C._P._Snow ( who wrote The Two Cultures). Author Koestler http://en.wikipedia.org/wiki/Arthur_Koestler,( who wrote Darkness at noon) and Sagan. The quote below fits in with the type of concept that we looked at. Snows book spoke of how few people in society understood what science was working on, and it was published in 1947! Koesler stood next to Orwell as the greatest anti-totalitarian of his day. If you are a fan of the 1980s band The Police, you may be surprised that their song titles, Ghost in the Machine, synchronicity, Invisible Sun and others were chapter titles in Koestler’s books. Bronoski was widely thought of as the last man who had full mastery of most of the branches of science, but his strongest attachment was to examining its morality. He filmed a segment about how science was about questions, not certainty of answers. To make his point, he contrasted the quest for knowledge with the Fascist certainty that they alone had all the answers. When the camera drew back he was standing knee-deep in the pond at Auschwitz where his families ashes were flushed. Get a good read on the Sagan quote below, it isn’t a pretty thought, but it is undeniable that things have shifted in the direction of his warning. We all have friends who send us warnings in the form of forwarded emails about Mexico taking Texas back, Idaho going to Sharia law, albino pythons that live in septic tanks and how the government hid the aliens at area 51. What Sagan was warning about is reality, and one way you can tell he was right is by the percentage of people who actually believe most of the garbage in internet stories. What does this have to do with Corvair flight engines? 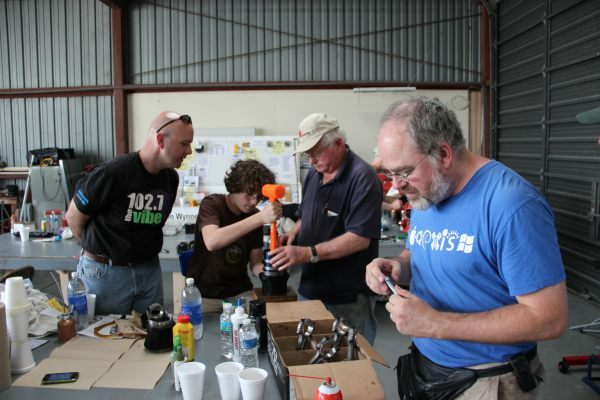 Any time you are working on your Corvair engine, building an airframe and developing all of your flight skills, you are supporting and participating in the real technical world, the world of Physics, Chemistry and Gravity. By learning and mastering any technical skill, you are making sure that there is one less undeveloped person in our world. I think that building and flying your own aircraft, a device that serves no purpose to society or government, something that is just for you the individual, is a very important act that reinforces the dignity and value of being an individual. No matter how you think we got here or what you think we are supposed to be doing, we can agree that the points in history were individuals had no value were not the brightest chapters in human history. I love animals and think they are great, but the two things that are supposed to set us apart are the fact we make tools and we can choose to act as individuals and not part of a collective herd. Funny how fewer people make and use tools these days and how that coincides with many people behaving more like a herd. Individuals creating art in any form, painting, music, dance or even aircraft building, even if it is done just to please one human, is just as important as any act for the greater good. Below is a letter from a new builder out west. The original letter was longer and split his thoughts between two topics. For the sake of covering just one of them here, I pulled out the paragraphs on the other topic. As anyone who has written in knows, I don’t edit or abbreviate things that builders write in, so It is important that people reading realize that this is a special case letter, where splitting out this half serves a purpose of covering this topic. If I do more than correct a spelling in a builder’s letter, I will say so, otherwise, printed as received. A few months ago I sent you a letter regarding the difficulty I was having in locating a Corvair Engine Core on the West Coast. A few words from you after you published my letter on your site put me in touch with a number of Corvair builders including Gary Boothe. After a series of false starts, it looks like I have located a couple of good cores in Medford, Oregon. I am headed there this week with your manual to verify the engine information and hopefully bring home to Redding, Ca,. two late-model cores that have not been opened in the past. Thanks for your assistance. William, really need your “leadership” when it comes to building an aircraft engine from a fifty year old “boxer engine” built by a car manufacturer who never before or after built anything like it again!!! Doug, you are correct externally, the Corvair is GM’s only air-cooled engine. But once you dig into the engine some, you will see that the engine is really a typical GM product. Al Kolbe lead the design team that did the Small Block V-8 just before he did the same for the Corvair. Internally there is a way more than you would think in common between these engines. 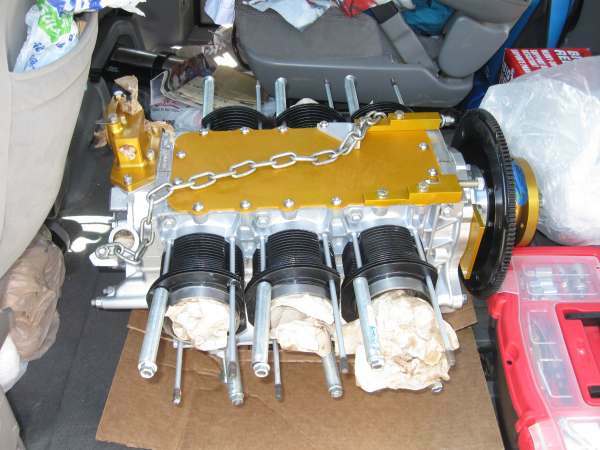 Not just things like using the same lifter, and rocker design, but also proportions like the Corvairs rod being a scale model of a 283/327 rod, the engine having the exact same oil pump cross-section, distributor shaft size and design, etc. The material and way the cranks were made then were the same. If you look at GM’s two other master pieces of the same era, the straight six and the big block, there are also many things in common. Most of the ignition system is the same as the straight six, the splayed valve design also is on the Big Block. I owned and built a number of each of these for classic GM engines. They are all very much from the same gene pool. This is why it is a great joke when some idiot tries to claim that the engine was designed overseas or it was made by a helicopter company. Those people are just BS artists. There are a number of circumstances that have changed since you published your manual. What about addressing those issues? How about the diminishing cores that are still usable? Can the original molds for the cores be purchased from GM or was it a “Lost Cast” process?? Can we be confident that these engines can be rebuilt in years to come? What about the crankshaft issues that creep in at about 300 hours even with a fifth bearing? The website is the main way that the information stays really crisp. This website got more words on it in the last 8 months than the manual has in it. You still need both, but the freshest stuff is obviously going to be here. The architecture of the conversion manual is the oldest of things we have in print. The Zenith manual and the Flight ops manual are much newer, we still update the manual with each new printing. Some people think of it as older, but when a new guy asks a question, 8 times out of 10, the answer is in the manual, he just missed it on first read. There really is no core issue. Have you run an ad on Craigslist in the “Wanted” section? If you wait to read things that are listed, you are doing it the passive way, and it takes a lot more time. There is no shortage of cores, it’s a myth that it easy to think when you are getting started. Lycoming built 270,000 engines total in their first 75 years in business. This is roughly the number of Corvairs GM built in 1964. Finding a Corvair is not hard at all compared to finding an O-200 near you. They built less than 40,000 O-200s. Which do you think there are more of 50 years later? The molds are said to exist, but they are not needed. Dan Weseman has already looked at building every part in the engine new and he thinks it is do-able. Lets look at what is already made new: Cranks, Rods, pistons, cylinders, pushrods, pushrod tubes, Valves, guides, seats, springs, all kinds of gears for the cam/crank/distributor, etc. So what part are you concerned about? Right now, today, you can build an engine from a case, an oil pump housing and two head cores. Dan knows a lot about modern manufacturing in metal, and he doesn’t think those last three parts are that tough. Keep in mind, Ron Lendon has an original set op manufacturing drawing for the whole engine. I do not know of any other conversion engine people are putting in a plane where clever entrepreneurial builders have access to the drawings. Your last comment “What about the crankshaft issues that creep in at about 300 hours even with a fifth bearing?” Touches a nerve with me. Maybe you just typed that in wrong, but if anyone said something you about 5th bearing engine having some “issue”, then I need the person’s name and number, and they are going to have an unpleasant phone call from me. That is another pile of BS. The only crank that has ever broken with a 5th bearing was Mark Langfords. and it broke at the other end of the crank. The 5th bearing has conclusively stopped crank issues, period. We are now six years into engines having 5th bearings. They work. When Mark broke his at 450 hours, he honestly felt that his aircraft was the harbinger of some issue. Yet in the 18 months since, no other engine with a 5th bearing has broken a crank. Some engines are now approaching 700 hours on a bearing, many are well beyond 300 hours. Engines have flown more than 1,500 hours without one, there is no reason to suggest that engine with a bearing are only going to last 1/5 of that. Again, if there is someone spreading that story, I want to know who it is. You have really touched on something with the new “parts catalogue” numbering system. William, I sent you an earlier letter asking you to review a list of items I was expecting to purchase in order to build a Corvair Engine. Although you did not respond to that letter, your new catalogue will help me make the right choices. That was the intent of the new numbering system. As you can imagine, with several hundred active builders, it is hard for me to look at every list that builders compile, especially lists from new guys who are yet to get a core and tear it apart. A number of people a month send me things on spreadsheets to study. I understand that this is something that guys who work in modern business do, but it isn’t a good use of my time. First 4 out of 5 of the emails require me to find some other software just to open it. (I rarely bother) Not a big deal to office guys. Come to a college and I will hand you a tool like a differential compression tester and ask that you test all six cylinders and give an analysis in 5 to 6 minutes. That task isn’t a big deal in my ‘office’ for me, but I am reasonable and don’t expect builders to perform like a professional A&P. Besides, I can teach any person with a room temp IQ how to build a good Flight engine much faster than the best computer guru could teach me how to work with spread sheets and find software applications. Computers are part of the craft that many builders do for a living. But lets keep in mind that our goal is to build engines and planes and go flying for real. The note on ‘plain speaking’ generated more mail than we have seen in a while. The quality of the thoughts are a real stand out. To my personal perspective, aviation is for thinking people, those that consider and evaluate, then act. The letters written tell me that we have this kind of people at the center of the Corvair movement. Not everyone has to come to the same conclusion or think alike, but the quality of the experience is always better with people who do think. Several of the letters expressed concern that I might not continue to write quite the same stuff. I am guessing some of this came from my choice of the word ‘defense.’ It might have been more descriptive to say, ‘the value of plain speaking.’ My concern was that new people might be put off by this stuff because it is in such contrast to the things people hear in aviation magazines. And, it is these new people who are most in need of this type of ‘wake up call.’ My concern was that I didn’t want to scare anyone off before they had a chance to read, think and consider the message. Sitting here, it is hard to tell how ‘Joe Smith’ out there reads this. I have feedback in letters, and almost every topic here is something I have said in an in person forum where you gauge how receptive people are. The only things that I don’t cover in forums are the things Like the Ken Terry story because it isn’t the right setting. For this reason, I appreciate all the letters people sent offering their thoughts on the subject. I chose not to put the hand full of notes that questioned the series up here for this reason: They are mostly from new people, and there people have probably not been a part of this kind of conversation in aviation before. Where else would they have come across it? Not in the magazines, not at the chain link fence FBO’s, not at Oshkosh and not from the home computer flight simulators. It is my hope that these people will read the letters here from many ‘old school’ aviators and think about why traditional builders find value in this type of conversation. Not printing their notes makes it easier for them to redefine their thinking in our community. A few days ago I saw a film that I have found moving since I saw it in the theater 30 years ago, “Tender Mercies.” Near the end of the film Robert Duval’s character gives a very painful speech where he says “I never trusted happiness, and I never will”, the implication being that happiness in his life has proven to be fleeting, but over time he had come to trust mercy instead. I am nowhere near that extreme, but I will say that I learned a whole lot more about life and the strength of human beings by learning from their adversities and struggles than I ever have by listening to the stories about the good times. -ww. William, as far as I know, the first amendment is still in effect. However I don’t know of any adjudication that mandates people read what they don’t like. I say, if it is offensive, troublesome, or, Downright irritating, no one is stopping anyone from copious use of the delete key. I, on the other hand, applaud your efforts at applying the past attempting to prevent future events of a disastrous nature from happening. I see no need for explaining the exercise of your right to free speech. Those that wish to curtail your, and my Right to say what is on our mind, by any of the methods available, need to revisit history and learn a thing or two.Charles Nowlin Houston Tx. US Military, veteran, who only gave “some”, to defend this right. “William, I found the stories spiritual and a reminder to me of those that changed my life in a significant way. Sometimes an event, sometimes a role model but once you live it, you are never the same. It did not come off as morbid .. , likely just missed the point. I just lost my mother. “My take on your reflection of past acquaintances and lessons learned is simply this: one cannot accomplish that task while underscoring the gravity of failure to do proper risk management by simply kind-speak and soft-peddling. Any amount of squishy, feel good sales speak cannot forewarn folks as to the seriousness of loss or express the hollowness of a senseless or avoidable tragedy. Any soul scared off from the experimental endeavor by an expression of truth, often presented in it’s rawest of states, probably should buy off-the-shelf…at least they will have someone to blame when it eventually fails them anyway. Over the weekend, The stories I wrote on Risk Management pulled about 1,900 page reads. Give or take, that is 700-800 different people reading them, some visiting more than once. From this came a handful of letters, and I was somewhat concerned that several of these were critical of the presentation because it spoke of the deaths of a number of people I once knew. This was called ‘morbid ‘ and ‘not about planes.’ I disagree, and I don’t feel that way when I write such things. Let me explain by introducing a friend whom I have great respect for. With me are Dave and Carmen, good friends to Grace and me, in a photo from SnF ’09. They have an extraordinary marriage. Their lives are an interesting juxtaposition. 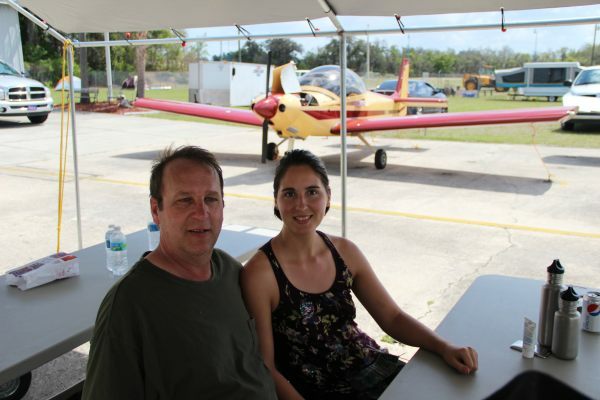 Dave has flown many of the aviation scenes in James Bond films, yet they choose to live deep in nature in a very rural part of Florida, in a primitive setting, like the novel The Yearling. These are people who really live in harmony with the world. They are deeply faithful, and in their view this includes drinking and dancing and happiness. They are the kind of people who went with Rodger Williams to Providence. I do not believe in ghosts, aliens, luck nor magic. Yet I will tell you that stand within arms length of Carmen, you can feel that she is a profoundly spiritual person. I am not alone in this, it is also said in her circle of friends. I accept that there are things in the human world that do not have, nor do they need, a detailed explanation. They just are. If you have never been in the presence of such a person, it is understandable, in all my travels and 50 years, I have only met 2 or 3 such people. The setting of Carmen’s life, and how she was raised could have come straight from a William Faulkner novel. She grew up with several very close sisters, one of whom died young. Several years ago she told me that every year, on the day that would have been her sister’s birthday, all of the sisters dress in their finest clothes, hand prepare an elegant picnic, and they spend the afternoon ‘with’ their sister in the cemetery. She said it is about remembrance and of the celebration of the life they had and still have. She speaks of still having her sister ‘with’ her. When I asked her how they came to do this, Carmen simply said that this was how she was raised and who her family is. When she looks you right in the eye and says this, you really understand that it is her family that is normal and healthy, and it is the rest of our society that is hiding and perpetuating its wounds. My version of remembrance of friends is writing about them. As I said in the story, I rarely think about these people when it is sunny and there are things to do. The thoughts only come back in the quiet hours, they are not with me every day. Some people are afraid to visit their past, and seek any distraction to avoid it. I have long since made peace with mine, apologizing for my failings. The only somber part of thinking of lost friends now is just purely missing their company. These people taught me a lot, and to not acknowledge that when I can, robs something from their memory. Almost everything that is known in aviation cost someone dearly. If we only choose to speak of ‘nice’ knowledge gained in R&D labs, I think we would have very little to talk about. People who have only spent a few months around my writing on Corvairs may have found the frank discussion disturbing, but in all fairness, our manuals and 14 years of webpage writing has never been far from this. I am not in the business of telling builders what they want to hear, I am just here to share what they need to know. As a courtesy to readers who would prefer just ‘engine company part numbers and build stuff’, I keep all of the human experience stories marked under the heading of “Philosophy”, and you will not hurt my feelings if you elect not to read them.-ww.